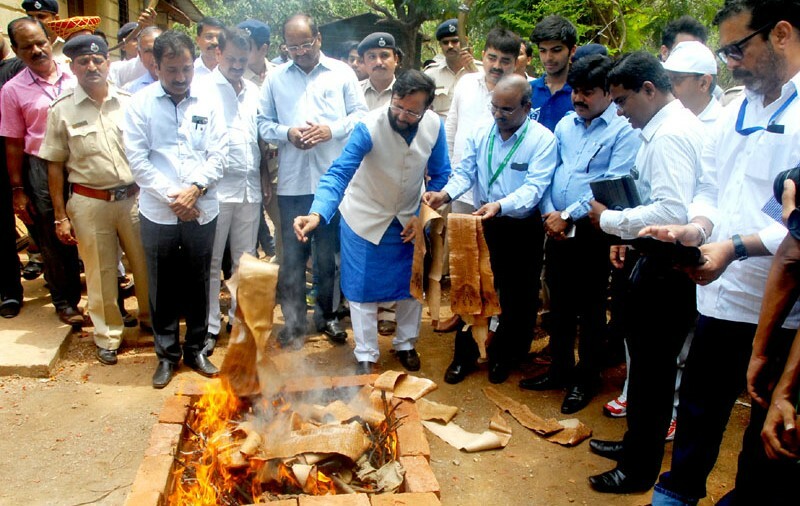 Environment Minister Prakash Javadekar disposes off confiscated Wildlife Articles during the World Environment Day celebration in Mumbai on June 05, 2016. The theme for World Environment Day 2016 is Go Wild for Life and focuses on stopping the illegal trade in wildlife parts world over. Drawing attention to this year’s theme of the World Environment Day – “Go Wild For Life”, Mr. Javadekar underlined government’s resolve for protection of wildlife. Speaking on Environment Day, he informed that the Government began this year’s World Environment Day celebrations by launching Asia’s first Vulture Re-introduction Programme at Pinjore in Haryana. Mr. Javadekar said vultures – the true Swachch Bharat volunteers – had become endangered since 1990, after eating carcasses of cattle which were injected with Diclofenac – a pain killer drug. “We had more than 4 crore vultures in the country, now not even 4 lakh are left,” he said. Speaking about wildlife protection, Mr. Javadekar asserted that trade in wildlife products should be completely stopped. He said the Government has also initiated proactive measures for protection of wildlife and informed that ‘shoot at sight’ orders have been given to armed guards at the Kaziranga National Park in Assam. 24 poachers have been killed so far to protect the endangered rhino. He appealed to the people not to buy any product made from wild animal body parts. “If there is no market for the products, poaching will end automatically,” he remarked. The Minister, later symbolically burnt the confiscated wildlife products in the open, to send a message to end the wildlife trafficking.